One of the most Picturesque stadiums in Australia, the Adelaide Oval has undergone redevelopment and emerged with a unique blend of the old and new. Worth mentioning are the Edwardian scoreboard, the giant Moreton Bay fig trees planted in the 1890s and the grassed mounds at each end, called ‘The Hills’, created in 1898 are all notable points of interest. Located in the Riverbank Stand, in a museum, is the Bradman Collection dedicated to the legendary batsman. The Adelaide Tour takes visitors through the iconic stadium and behind the scenes. The home of cricket in South Australia, the stadium also plays host to Australian Rules football, rugby and soccer events. The Adelaide Oval also doubles as an outdoor concert venue and has also hosted concerts of legendary musicians like Fleetwood Mac, David Bowie, KISS, Madonna and Paul McCartney, Michael Jackson, Billy Joel and Elton John, P!nk, Pearl Jam, AC/DC, Wolfmother and Foo Fighters. The Adelaide Oval stadium is considered as one of the most beautiful stadiums in the world and has witnessed many iconic cricket matches, over the years. If you’re a true blue sports lover, then this is an attraction which you should consider, definitely. The best way to explore it is by booking the Adelaide Oval tickets that will help you to avoid the longer cues and give a faster access to the attraction. Tickets for Adelaide Oval can be bought at the counter, but for getting the specific Adelaide Oval tour tickets, it is better to pre-book. Viewing of the Bradman Collection and Stadium Tours may be cancelled or postponed during sporting events at the Oval. 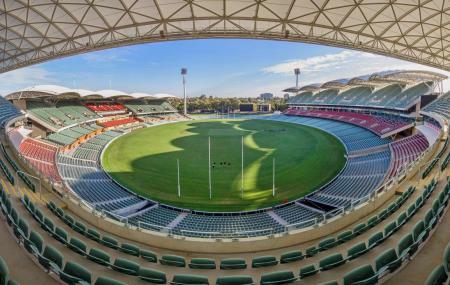 Adelaide Oval Stadium Tours operate Monday to Friday from 11 am and 2 pm. The Bradman Collection is open from Monday to Friday from 10 am to 4 pm. Bus: King William Rd West and Montefiore Rd West Bus Stops. How popular is Adelaide Oval? People normally club together South Australian Museum and Ayers House Museum while planning their visit to Adelaide Oval. What a great oval, easily one of the best in Australia. They have blended the old stadium with the new stadiums perfectly. Close to the city and easy to walk to. All of the seats have a great view and it is great that they kept the old scoreboard and the hill. The only issue is the price of food and drink, it is a joke. $10.30 for a mid-strength beer, $6.40 for a bottle of water and around $5 for a small hot chips. We all know that oval food is expensive but it really is over the top. If they can reduce the cost of food/water then it would be 5 stars. My initial response is the aesthetics, I think it's a brilliant looking structure both inside & out, but the proposed new hotel, in my view, would detract from the overall spectacle. When one considers this venue has a capacity in the vicinity of about 55K, there is a relative ease to both get in & out of the oval. The buses are in close proximity upon arriving or departing, the bridge offers easy access across the Torrens & into the city. I even found city car parking convenient with a minimum of fuss at a reasonable price. The venue offers plenty of food & drink outlets, also plenty of toilet facilities, a substantial improvement on Football Park. We all know about the excessive & exorbitant prices charged for food & beverages, an unfortunate imposition & unnecessary negative. Most agree that retaining the grass hill & old score board, not to mention the outstanding trees, is a masterstroke that adds to the ambience & atmophere to the well designed stadium. It's easy to discern why Adelaide Oval is regarded as one of the best, particularly as a cricket ground. I love & prefer the night games, both footy & cricket, it enhances the experience for me. You don't need me to convince anyone that this is a huge recommend. Cheers. Visit was to watch cricket. It was in a members area so seating was ample and superbly situated. It was possible to watch seated at a table inside as well as seating just outside.the view of the game was excellent with lighting making it a great special.